posts are District Consultant, Medical Officer, Dental Assistant, Pharmacist, Staff Nurse, Feeding Demonstrator, Lab Technician, ANM, DEO, PADA, Counselor and Attendant jobs. Eligible and interested candidates may attend the walk in interview as per given dates along with all original documents. 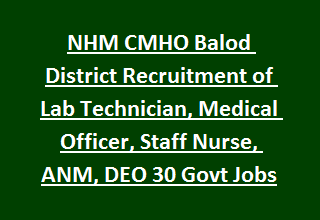 Candidates will be selected for this NHM CMHO Balod district jobs based on their educational qualifications merit, work experience and skill test/written test/interview. Complete information about this NHM of the Chief Medical & Health Officer recruitment of Balod district age limits, selection process, pay scale and walk in interview dates are given below. There are total 30 vacancies in this National Health Mission CMHO Balod district Recruitment 2017. As on 01-01-2017 upper age limit for all the posts is 64 years. Candidates will be selected based on their marks in educational qualifications, previous working experience and interview or written test or skill test wherever required. For the posts which salary is more than Rs.25000/- application fee for general is Rs.650/- and for other Rs. 400/-. Candidates must have bring the original documents of all educational qualifications, experience certificates, and 3 passport size photos and one set of Xerox copies of all documents, date of birth certificate, residence certificate, caste certificate, ID and address proof and other related documents. Attend the interview as per given dates in notification.